Peter Parker always tries to keep a low profile and do normal teenage things. But, there seems to come a moment in each film when he must, somewhat reluctantly, realize his potential, become his true self and respond to a great crisis at hand. It may seem like an odd analogy, but I think Spiderman has a lot to teach us about the church. Confirmation season is in full swing in the Archdiocese of Louisville. One of the best parts of my job is getting to visit with some of the confirmation classes to talk about the “next steps” after they receive the sacrament, which for some might include participation in a liturgical ministry. Confirmation is not akin to graduation. Not an ending but a beginning, it is the start of life in the church as fully-initiated members. What does that mean? I often begin my sessions with these young people by quoting Spiderman. “With great power comes great responsibility.” Is that not what it means to be a Christian? In receiving the grace of the sacraments, are we not called to respond to that grace with action? With a “spidey sense” comes the responsibility to save the world. With the gifts of the Holy Spirit comes a responsibility to set the world on fire. Even if reluctantly, we must cultivate our gifts and share them in the service of God, the church and each other. The Mass is a place where this drama is played out week after week, where our commitment to be our best selves is renewed. You might think that the bread, wine and money collected are the only “gifts” presented at Mass, but the church teaches something much richer. While you’re waiting for the Spiderman movie to come out, I invite you to view “Bringing Our Gifts,” the second installment in our video series on the people’s role at Mass. 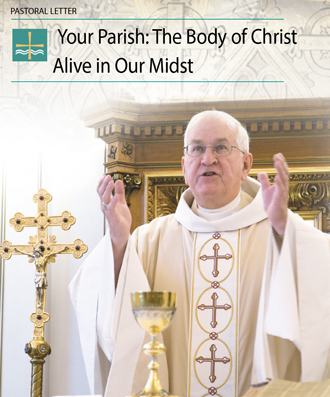 In it, I asked some of the people of our archdiocese to reflect on their gifts and the ways they offer themselves in the Mass. Their answers filled me with joy and hope in the potential of God’s people. These individuals and so many others like them are truly the superheroes among us.